“STATE FAIR” CAST MEMBERS proudly express their love of their home state in the musical number, “All I Owe Iowa” during Saturday night’s community theater performance, sponsored by the Fine Arts Council of Tracy and Tracy Community Education. 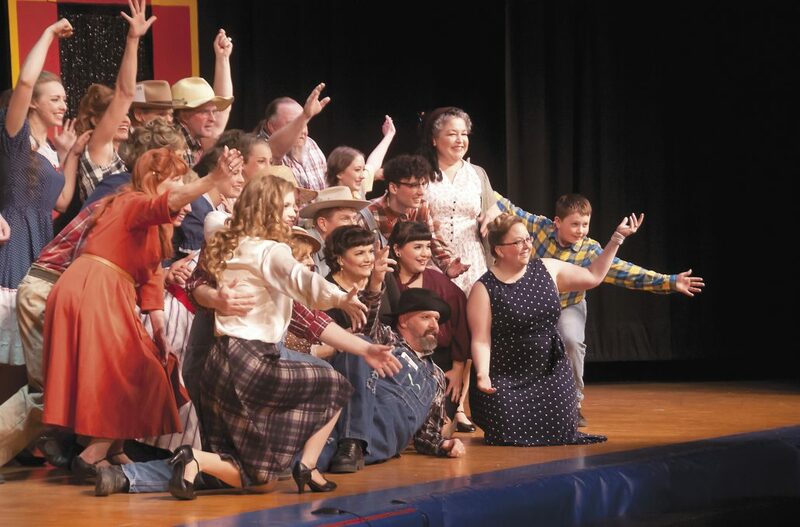 It was all about Iowa this past weekend at the Tracy Area High School, as a cast of local thespians and singers presented the Rodgers & Hammerstein musical “State Fair,” under the direction of Erin Dahmes. The musical — put on by the Fine Arts Council of Tracy and Tracy Community Education — was performed Friday and Saturday nights and again on Sunday afternoon in front of a total of about 900 people. More than two dozen Tracy and area residents started rehearsing for the musical in January. They were joined by the Tracy Children’s Choir in singing “Our State Fair” in the third scene of the musical.